Eighty years ago both King Kong and Doc Savage debuted to new and comparatively stunned audiences. The year was 1933, and while they each appeared in different media, Kong on the silver screen and Doc in print, they both quickly became a part of American mythology. For the first time in history the two icons cross paths in Will Murray’s new novel, Doc Savage: Skull Island. While Mr. Murray has written several books featuring Doc before, each one of those were based on writings or outlines by Doc’s primary scripter, Lester Dent. This is the first time that Mr. Murray has taken the reigns himself, and he knocks it out of the park. Crafting a story that centers on the early days of Doc Savage and his place in the Savage family, Mr. Murray has created a near-perfect pulp-style rendition of what mythologist Joseph Campbell has called “The hero’s journey.” Only before sending Doc on his “quest,” Mr. Murray begins at the end of the story, veering off from the more traditional straightforward narrative. He begins his tale with the image of the fallen Kong lying dead on the streets of New York. Carl Denham has already uttered his immortal “. . . it was Beauty killed the Beast” and hours ago walked away from the havoc he has caused. The morning sun is breaking across Manhattan and there is one big ape broken, bleeding and crushed on the streets of New York. The mayor calls Doc Savage to help remove the body. Since Doc famously lives on the 86th floor of the Empire State Building and has connections that may possibly eclipse those of the great city itself, it is only natural. As Doc and his crew prepare to remove the ape and secretly return him to Skull Island, a previously untold story emerges. Since Doc is not known for telling stories in general, his crew sits transfixed as the bronze giant begins to explain why he must take Kong back to his natural home, Skull Island. He begins with the end of World War One. Having just left Europe at the end of the conflict, Doc unexpectedly urgent summons from his father, Clark Savage Sr. The old man wants his son to help him find his own father, Stormalong Savage. While Kong does play a major part in the book, the center of the story holds true to the promise of the title. 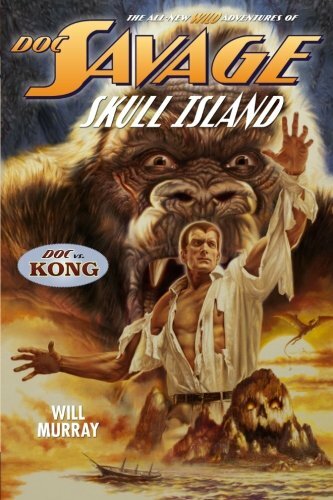 The book is about Doc Savage and Kong’s home, Skull Island. Over the course of the tale we experience Savage’s growth as a leader and as a man. The author takes us into Doc’s mind as we see him learn to make decisions and choose which battles to fight and which ones to walk away from. The young man who has just experienced the horrors of war finds out that he does not know everything. The conflict between Doc and his father begins early. The elder Savage is looking for his own father, a legendary, able-bodied seaman who was lost at sea. Naturally Doc, a man who barely knew his own mother, is intrigued by the near-impossible nature of his father’s own search. Doc has to not only rise to the challenge of dealing with his domineering and controlling father, he also finds himself in the middle of the prehistoric anomaly that is Skull Island—a place where neither experience nor imagination can help anyone deal with the horrors, the headhunters, and the massive scale of the physical surroundings that the Island holds. With patience and a skill honed over the course of 60 other novels, Mr. Murray has written his finest work. Doc Savage: Skull Island transcends the character’s pulp origins and moves into the realm of classic adventure fiction. It comes close to matching the best writing and ideas of Verne and Burroughs while nearly equaling Sir Arthur Conan Doyle’s tale of displaced dinosaurs and crazed jungle inhabitants, The Lost World (itself an original inspiration for Kong and Skull Island). In each case Mr. Murray acknowledges what has come before by having the Savage family refer to or directly quote the writings of Burroughs, Conan Doyle and even Shakespeare himself. This grounding of the characters inside the literacy of the day adds a new dimension to the story. It also reminds us how important these previous writings in the genre were. When Kong does enter the novel, it is with the dignity, force and awareness of someone who is truly a King. Mr. Murray’s portrayal of the great ape is as filled with life as his screen incarnation was, maybe even more so. For as our mind’s eye sees the massive force of nature felled by the poisoned darts of a tribe of headhunters looking to make a trophy of his skull, it is impossible to not feel your heart moved by the scene as he falls in defeat. The relationship between Kong and Doc, as well as the one built between the ape and Stormalong Savage is real, the connection deep. As with so many of the classic adventure novels, there are plenty of bodies, plenty of battles, and plenty of amazing discoveries—the least of which are the inhabitants of Skull Island itself. Dinosaurs, reptiles, insects, and even plants come alive. Everything on Skull Island is an evolutionary freak, and Mr. Murray uses this license to create thrilling scenes of battle and danger. Across close to 400 pages Doc Savage: Skull Island takes us not only on a journey to Skull Island, but to the beginnings of a young man’s rise to greatness. Mr. Murray has created a new classic of the genre—all the while staying completely true to the legends of both Kong and Doc Savage.